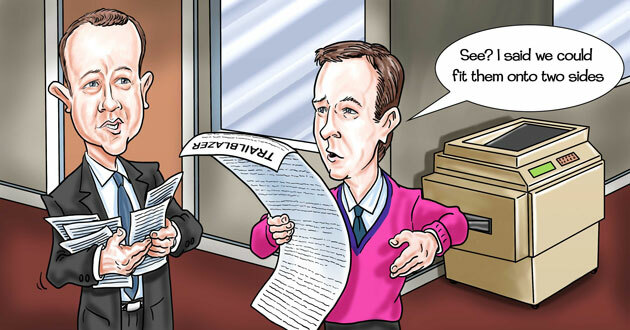 Skills Minister Nick Boles has relaxed much-vaunted rules set by his predecessor, Matthew Hancock, that limited new apprenticeship guidelines to two sides of A4. Former Skills Minster Matthew Hancock had already said in March last year — four months before he became Business, Enterprise and Energy Minister — that he wanted a “two-side description of the skills, knowledge and attitude employees need”. But a spokesperson for the Department for Business, Innovation and Skills (BIS) confirmed Mr Boles had since approved six standards running to between three and five A4 pages. She told FE Week: “For some sets of occupations with a common core, rather than having lots of separate standards it may be preferable for a Trailblazer to develop a single ‘core and options’ standard. The longest approved standard is five pages for hospitality managers (level four). The standards running to four pages are for craftspersons (level three), published four months ago, and digital and technology solutions professionals (level six), furniture manufacturers (level two), hospitality supervisors (level three), and hospitality team members (level two). Meanwhile, a three-page standard has been approved for laboratory scientists (level five). Brigid Simmonds, chief executive of the British Beer and Pub Association which helped develop the over-running hospitality standards, said sticking to two pages would have been “a challenge”. She said this was, for example, because “being a chef in a hotel or silver service restaurant is very different from being a chef in a pub. “While the apprenticeship standards may be a little longer, it is for a very good reason”. Teresa Frith, senior skills policy manager for the Association of Colleges, warned keeping standards “streamlined” could “risk losing consistency in the way standards are interpreted”. Government approval has so far been given to 144 standards, covering industries including accounting, dental health, nuclear, retail and TV production and broadcasting. But only 15 of these — all of which are two pages long — are currently rated as “ready for delivery” by BIS, with the rest awaiting Mr Boles’ approval on assessment guidelines.